With the cost of a gym membership reaching ridiculous levels, a gadget like the Fitbit Ultra makes a fair amount of sense for anyone looking to shed a few kilos. But at $US100/£80/$AU120, the Ultra is a bit on the pricey side for a lot of people. Enter the Fitbit Zip, a cut down version of the Ultra with a much more attractive $US60/£50/$AU70 price tag. By cutting away the stair counting and sleep tracking functions of the Ultra, the Zip is significantly cheaper, yet still offers the key functions of the original device. 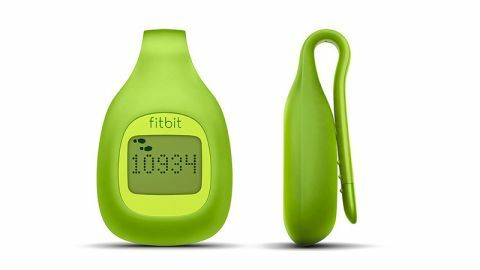 For anyone not familiar with the concept of the Fitbit, it's a tiny step counter that uses integrated sensors to record how many steps you take each day. From there, it calculates how many calories you burn during exercise, as well as how far you've travelled. It then syncs this information to your Fitbit account, to give you an ongoing look at your exercise patterns. The Zip is a tiny little gadget that fits inside a silicon sleeve belt clip. While the clip feels secure, On more than one occasion we discovered it sliding off the pocket it was attached to. A replaceable battery hides in the main unit, although it needs a special tool to be removed. The 3V coin battery has a claimed life of up to six months, which could prove more frustrating than having to recharge each week like the Ultra model. Using the Zip is simplicity itself. The LCD display alternates between a general performance screen consisting of different smiley faces, a step counter screen for each day, a distance travelled screen for each day and a calories burnt screen for each day. Alternating between the screens is as simple as tapping the screen. It doesn't have anywhere near the same responsiveness as a smartphone's touchscreen, but it does work well enough to get the information you need. Truth be told though, you don't really need to look at the screen at all. The Zip comes with a USB dongle to plug into your computer which automatically syncs your data whenever it's close enough. The Zip also offers Bluetooth 4.0, which allows you to sync directly to a compatible smartphone like the iPhone 5 using the low-power syncing option. This means your data can be pushed to your smartphone automatically, without the need for a PC or Mac at all. What separates Fitbit from a traditional pedometer is the ecosystem designed to help encourage exercise. By accessing your Fitbit account, either online or via the smartphone app, users have access to detailed data on their exercise performance. It also offers recent weigh ins using the Fitbit Aria scale, and the ability to enter food for calorie counting your diet. The food aspect of the Fitbit ecosystem is easily the most disappointing part of using a Fitbit device. The food database is exceptionally US-centric, with few international foods available. You can manually enter data for food consumption, but without the easy search function to find the foods you eat, it's hardly worth the effort at all. Fortunately, the Fitbit ecosystem is also open to third party applications. And for this Australian reviewer, the fact it syncs with the MyFitnessPal ecosystem changed the entire usage model. By counting calorie consumption with MyFitnessPal, which is automatically offset against Fitbit exercise offers a comprehensive management regime for weight loss.